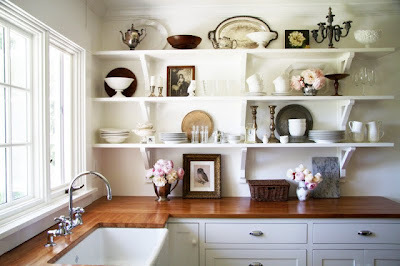 I love the open shelving in this kitchen, the windows that almost reach the counters, and the butcher block countertops. This limestone floor is almost the color of ours. 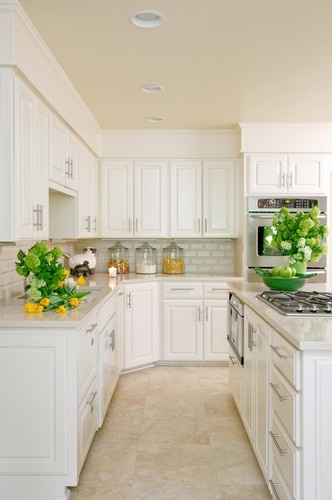 I like the white countertops with the limestone floor. 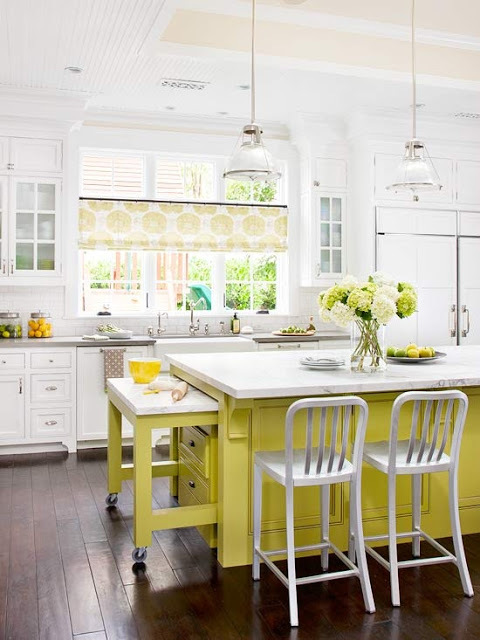 The chartreuse in this white kitchen is fun. Why not a curved bar instead of a squared-off one? 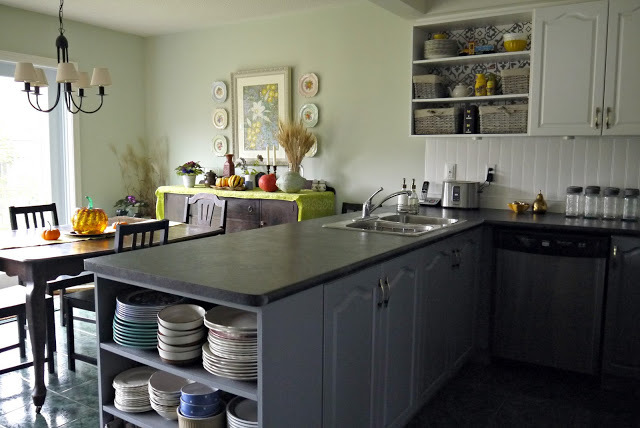 More open shelving, aqua paint, robin's egg blue paint, and butcher block countertop....so pretty! Our kitchen island is configured just like this one: breakfast bar is bumped-up, and our cooktop is down below. This bar is curved, also. 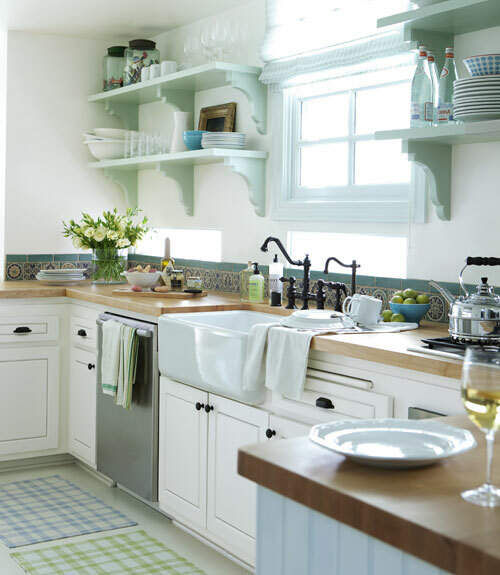 Grace's kitchen is pretty inspiring, too. 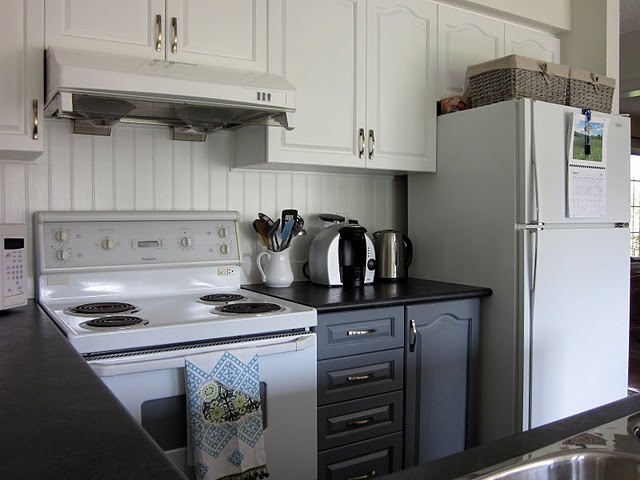 She painted her base cabinets and installed a beadboard backsplash. 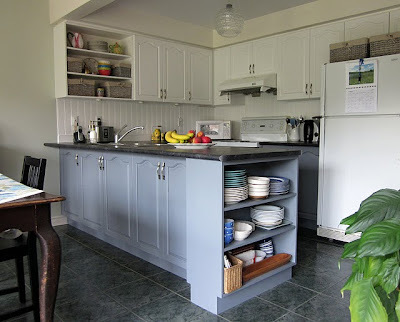 I love the slate blue of the base cabinets. It reminds me of Alabama bluestone, and folks use that quite a bit here along with slate in their kitchens. If I had that type of flooring, I'd paint my island and/or base cabinets this shade of blue. Since Grace's kitchen is u-shaped, she doesn't have an island. I really like her open shelving at the end of her peninsula and above her counter. Our installers measured to see if shelving would fit at either end of our island, but there wasn't enough room. LOVE these shelves. I also think it's smart to have access to the cabinets from the kitchen and the dining room. Very convenient! Grace's open-concept dining room is to the left of these shelves. 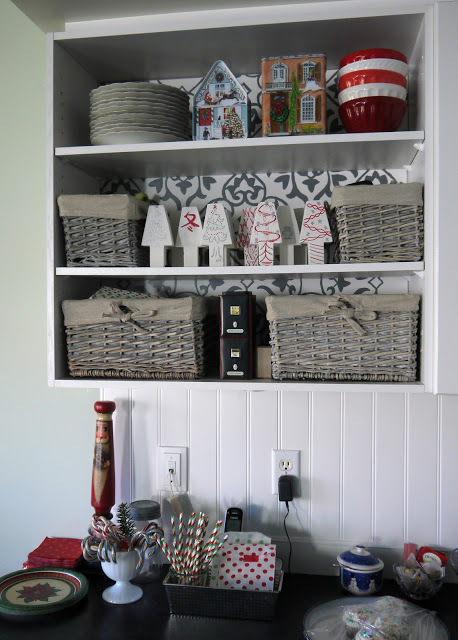 I love the back of her shelves, and she posted a tutorial on how to make it. Here, Grace decorated her shelves for Christmas. She accessorizes for every season. I love that! Grace's home is very personal, and her posts are as unique as she is. I've learned so much from reading her blog! You can tour Grace's home here. Her white kitchen posts can be read here, here, and here. I'll be spending the next week working on our kitchen. There is dust everywhere, and I have to wash everything in it. *but* It's so worth it to have our counters repaired. Oh, I love the images here. I'm gonna have to follow you! 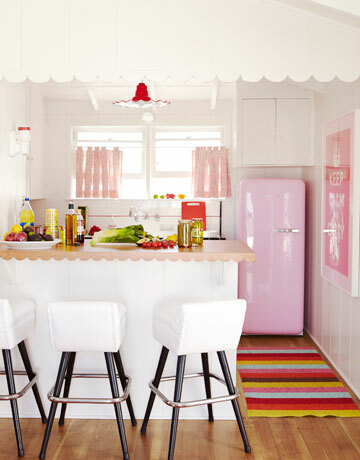 I think if I were a single gal and living in a cute apartment I would totally love the look of the pink kitchen with the smeg fridge for sure! These kitchens are awesome...I really love wood counters. Not like the butcher block counters back in the day. I will have to check out Grace's blog. Hope everything is coming along well in your kitchen! Great pictures. The pink fridge is so cool. Thanks so much Ricki Jill. I was surprised (and very flattered) when you emailed me to say you were writing this post. It's funny to see my kitchen in a post with some of my favourites. 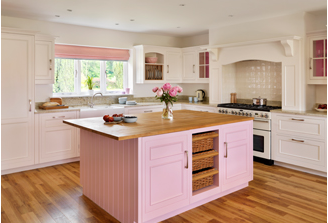 I'm looking forward to seeing your kitchen re-do and seeing what you chose. Wonderful inspiration! 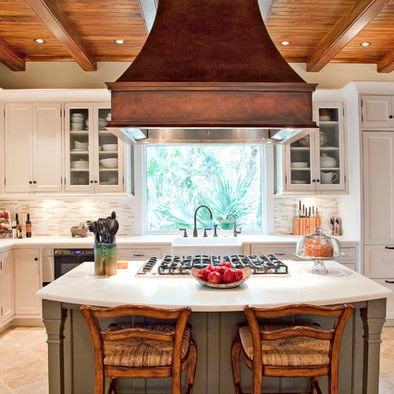 Love the curved bar with the stovetop and beautiful copper hood. I love the open shelving. I would really like to have it, but we have so few cabinets and I am afraid that they would usually look messy. Lots of great ideas! 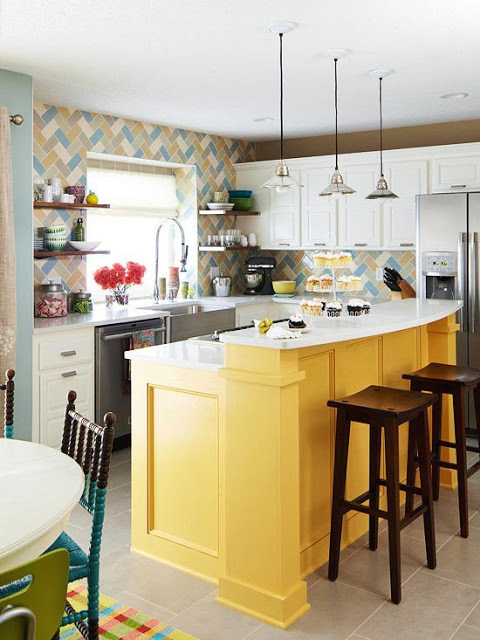 I love the kitchens with color and an island. What I wouldn't give for a spacious kitchen! What fun, messy...but fun! Can't wait to see what you are up to! I've been looking at Robin's Egg blue for our kitchen. It looks so calm and pretty. 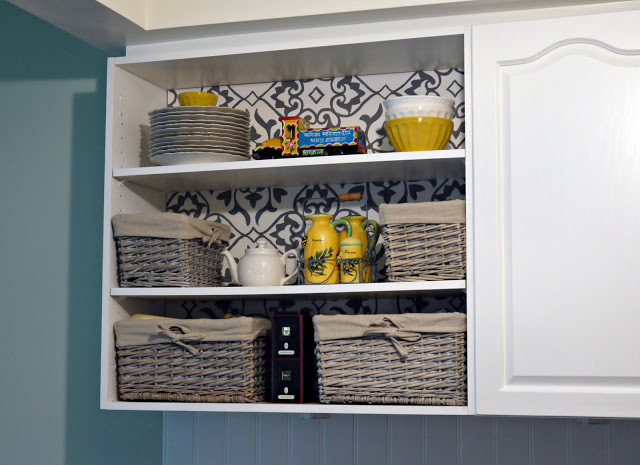 Wish my cabinets were organized and pretty enough for open shelving. It really looks wonderful. I love her kitchen too and so many of the other ones! Great inspiration! All the above posted kitchen ideas are great, open shelving is a nice choice but they require cleaning on daily basis, this is why i don't like them that much. I have a real love for kitchen photos. These are great inspiration pics and I did follow this series by Grace. She has such a keen eye and I love the shelving at the end of her kitchen peninsula. It is always fun to see what 'real' people do with their own kitchens. It always feels more attainable to me. I am also doing open shelves. How much space are you putting between shelves?